Our focus is on systems that are complex due to rheological properties of the considered fluids, complicated flow geometry, complex multiphysics aspects of the forces governing the flows, or a combination of these factors. We carry out modeling and simulations of such problems, as well as developing appropriate computational methods. In some cases, we also carry out physical experiments in our Undergraduate Capstone Laboratory in coordination with the Capstone Course taken by our applied mathematics majors. Our work is carried out in collaboration with mathematicians and scientists from a number of different institutions (listed on our Research pages). Our research is supported by the Center for Applied Mathematics and Statistics, the Department of Mathematical Sciences, and by grants from a number of federal research agencies. Jul 2018: Congratulations to Profs. Cummings and Prof. Kondic on new NSF research award for study of Liquid Crystals! 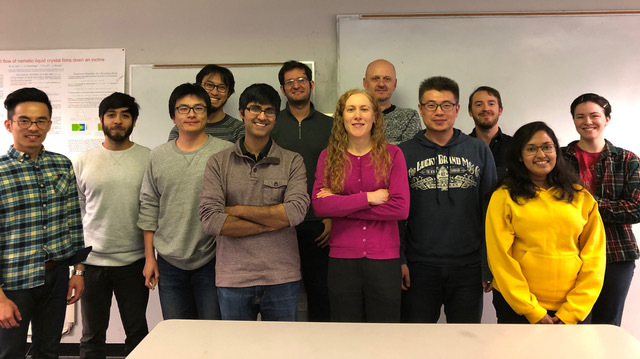 Apr 2018: Congratulations to Michael Lam for his successful thesis defense on April 24th! Apr 2018: Congratulations to Valeria Barra for her successful thesis defense on April 24th! Apr 2018: Congratulations to Ryan Allaire for winning DOE SCGSR Fellowship. Ryan will spend 3 months at ORNL. Oct 2017: Lou Kondic has been elected a Fellow of the American Physical Society. Aug 2017: Ivana Seric has accepted a position with the Philadelphia 76ers as a Data Scientist in Analytics and Strategy - Congratulations, Ivana! Aug 2017: Ivana Seric defended her thesis on August 1st in Cullimore 611. Jun 2017: Pejman Sanaei defended his thesis on June 16th in Cullimore 611. May 2017: Linda Cummings was an invited speaker at the Applied and Computational Complex Analysis workshop to be held at the International Centre for Mathematical Sciences, Edinburgh, UK. Apr 2017: Nanyi Dong defended his thesis on April 26th in Cullimore 611. Mar 2017: Pejman Sanaei has accepted a position at the Courant Institute for Mathematical Sciences, NYU, starting September 2017 - Congratulations, Pejman! © 2017 NJIT DMS Complex Flow and Soft Matter Group. All rights reserved.